Angus Horn, head chef and proprietor of the But 'n' Ben in Auchmithie, on how to spot the perfect Arbroath smokie, and the best ways to use them. We get our smokies from Alex Spink. 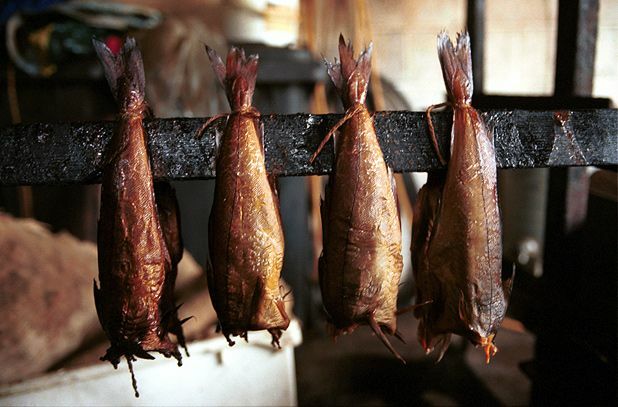 The perfect smokie is fresh when you open it up, juicy and moist, not dried up like other smoked fish can be. We usually cook the fish nice and simply with butter under the grill, or make smokie pancakes by mixing the fish with a cream sauce and folding it into a pancake. We also have smokie soup on every day. Chefs around here don’t cook with them that much; I’m often surprised how little they’re used. All the cottages in Auchmithie used to smoke their own. I’m not from Auchmithie originally, but my mother and grandmother were born in the village and I can still remember the very last man smoking when I was a teenager. I’ll always feel that connection. ● Angus Horn is head chef at the But ‘n’ Ben in Auchmithie.